McLennan Sound Monitoring, Inc. offers two unique single-ranged instruments. For high sensitivity areas 41dBA – 101dBA range, and a standard range of 61dBA – 121dBA. A whisper from two feet will activate the 41dBA LED. Normal human conversation ranges from 60 – 80 dBA. Low level talk from two feet will activate the 61dBA LED. Each instrument is specifically constructed for continuous duty sound monitoring to provide automatic and instant sound level information. 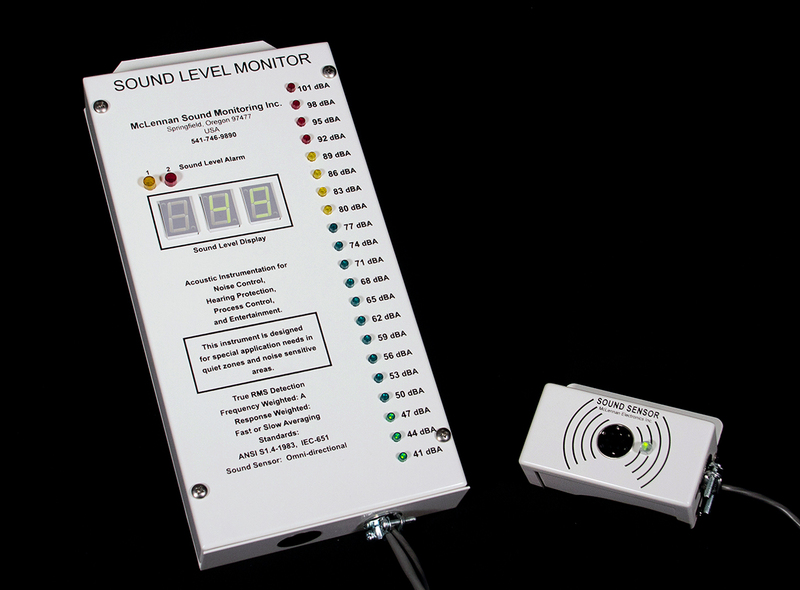 With the remote sensor near the noise the main instruments highly visible displays (digital and light bar) show current sound levels at a glance to help viewers accurately assess their need for hearing protection or volume control at the sound source. Unlike portable sound level meters, used for occasional or momentary sound checks, this instrument is intended to be mounted in a permanent location permitting the true variety of sound levels to be revealed. The two adjustable alarm options permit you to set each alarm for your critical sound levels. The 4-20mA current output option can allow for charting, data logging, and input for controller applications. The remote noise sensor assembly consists of a noise sensor mounted in a laser-cut, powder painted, 16-gauge metal chassis. The noise sensor assembly is connected to the main instrument with a four conductor cables and has an “on” indicator LED. Due to the power-balanced low impedance return signal, the remote noise sensor can be placed up to 1000 feet away from the McLennan sound level monitor main instrument without significant change in the signal. Noise control, public awareness and education are keys to a healthier lifestyle. McLennan Sound Monitoring, Inc. provides the tools you need to achieve these goals.